The Mentors & Students series celebrates the importance of art in a child's life. The elementary student show, Art of Our Children, starts the series, usually in mid-February each year. Student performances are often featured at the opening receptions which are free, open to the public, and accessible to all. Queen Bee, by Isabel Workman, 1st place winner in 2018 Artists of Tomorrow exhibition. Celebrating the importance of art in a child's life, the series opens with the elementary art exhibition titled The Art of Our Children. 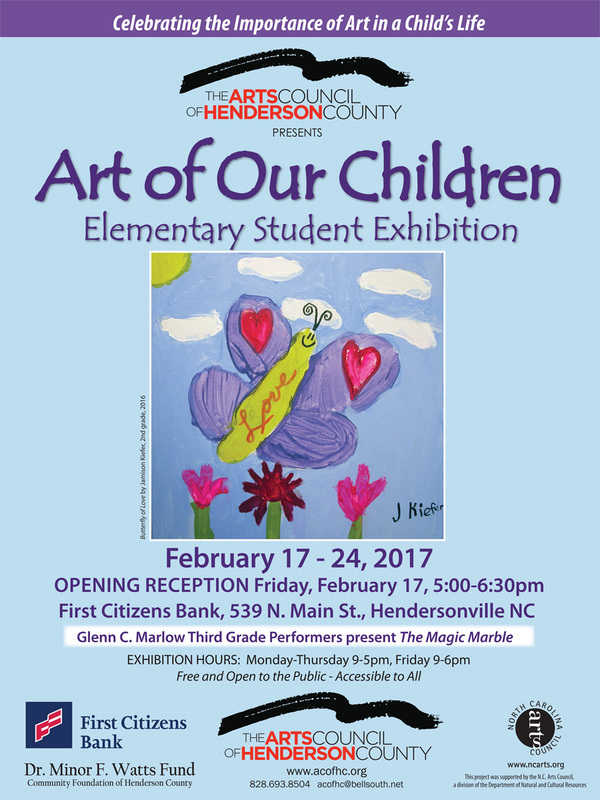 All three exhibitions feature Henderson County public, private, parochial and home school students and teachers. All artwork is offered for sale during this show. Win a free piece of art from this show. Drawing to be held March 16, need not be present to win. The artwork from middle and high school students is judged and winners are announced at the opening reception. The Best of Show award of $150 is sponsored and presented by the Art League of Henderson County. Win "Carefully Attended Pebbles" in free raffle! Selected from the "Art Teachers Create" exhibition, this piece titled "Carefully Attended Pebbles" by Marian Kirchner Congdon will be given away in a free raffle drawing on March 25, 2019! Many thanks to Woodlands Gallery for purchasing the piece for the free raffle! Art Teachers Create displays the work of art mentors in Henderson County.